Omny Studio can listen to an existing Internet radio stream you are already broadcasting, and ingest this stream into a Program’s Recordings area. 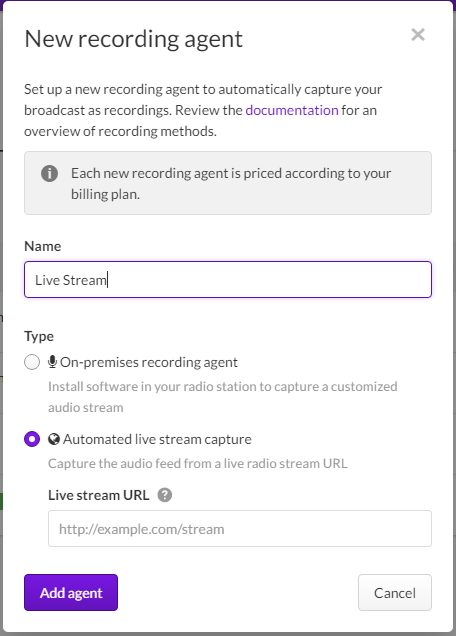 Head to https://omnystudio.com/settings/liverecording and click "set up new recording agent". You will be presented with this form which requires the direct URL of your live stream. If you can't find your URL, please contact Omny support or your live stream service provider. If you have a Triton or SHOUTCAST live stream, you may be able to trigger your recordings using the metadata in your stream. Read more about that option here.